Art Basel Miami Beach takes place December 6 - 9, 2007, although ABMB itself has become such a magnet for art symbiots of all kinds that the event now encompasses more than the 200 leading art galleries from North America, Latin America, Europe, Asia and Africa which will exhibit artworks by over 2,000 artists at the "real" ABMB. There are now well over a dozen satellite art fairs all revolving around ABMB, and quite a few DC area art galleries and private dealers will be represented in several of these fairs. It's a long way since the now-closed Fusebox Gallery became the first DC area art gallery to venture to the Miami area in 2003; as I recall to show Fusebox artists at The Art Positions section -- those air-conditioned shipping containers right on the beach. The more I talk art fairs to gallerists and art dealers the more that it makes sense why a good gallery should do at least 3-4 art fairs a year. Some Philadelphia gallerists that I have spoken to have been "saved" from closing down in stingy Philadelphia because of art fairs. "About 75% of my yearly sales now come from the three art fairs that I do each year," related to me an Old City gallerist. "Next year I am going to apply to double that number." Moral of the story: If you are a gallerist, you owe it to your gallery and to your artists to start applying to the high quality art fairs such as Scope, Bridge, Aqua, Flow, Art Miami, Pulse, the Armory Show, LA Art Fair, Art(212), Affordable Art Fair, Red Dot, Pinta (for Latin American art), SOFA, NADA, Frieze, ARCO, Art Santa Fe... the list goes on an on - just click here to see how many different art fairs there will be next weekend in Miami. However, an art gallery, a good art gallery anyway, is not just an art store, but an integral and key part of the cultural tapestry of a city. As my good friend John Pancake once told me, "a heroic venture." And so the true and valid model for a good and reputable art gallery seems to be a mixture of a brick and mortar establishment, a substantial and organized and updated web and digital presence, and a healthy assortment of art fairs. Gallerists: Start applying now for 2009 - most 2008 deadlines have already passed! Or stop complaining about being unable to sell artwork in your local market. Multiple congrats to former DC area artist (now living somewhere in Atlanta) Jiha Moon, whose work was recently acquired by the The Mint Museum of Art in Charlotte, North Carolina, which also (a while back) acquired a work by DC artist Tim Tate. Second congrats because Moon is also having her European debut at the Miki Wick Kim Gallery in Zurich, Switzerland. 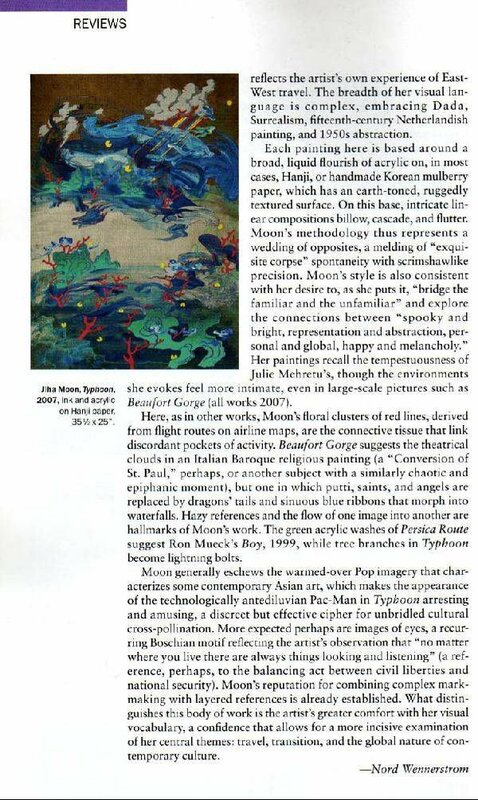 Update: The Mint Museum has advised me that Jiha Moon will have her first solo museum exhibition at the museum February 2 through July 6, 2008!